Sprouts of Hope, an offshoot of Jane Goodall‘s Roots and Shoots comprised of a handful of girls who are now at Cambridge Rindge and Latin High School, is presenting their “Imagine a Sustainable Life Quilt” to the City of Cambridge today at City Hall, making Mayor Davis and all of us here in the people’s republic proud. Apparently citizens can request to have the quilt visit public sites around Cambridge. 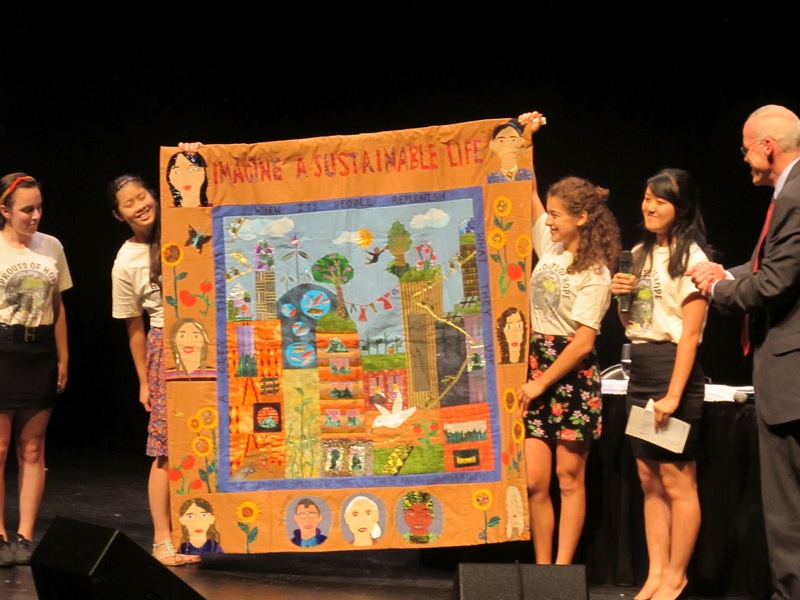 Did I mention Clara Wainwright was involved, Bill McKibben’s portrait is on the quilt, and the kids met Gloria Steinem? Categories: Cambridge, Massachusetts, Education, Jane Goodall | Tags: 350.org, Bill McKibben, Cambridge, Cambridge Rindge and Latin, Clara Wainwright, Crafts, Henrietta Davis, Jane Goodall, Quilt, sustainability | Permalink.